Uncommon Goods have some of the coolest products out there! For my review, I received some great cyclist related gifts. 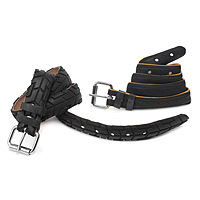 The first item I received was this really cool Bike Tread Belt. This belt is so cool! It is actually made from recycled bike tires. Talk about re-purposing! I gave the belt to Aaron, (Let me say - He is SO picky about his belts! He's had the same belt for more than 10 years!) and he loved it! When I first handed it to him, he said "What is it made out of?" when I told him, and was like "Really? That's awesome!" He's been wearing the belt since we got it :)! And the other great gift I got (These would make great Gifts for Cyclists!) was the Bike Lights. Me and Aaron love riding at night! We do it daily, actually. 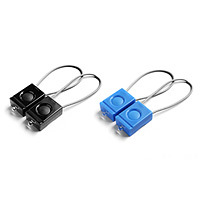 I used to have some bike lights, but the screw fell off, and I lost it one night; So I was really excited to get these! My favorite thing is they way the lights attach. They wrap around the bars of the bike, and then they hook onto themselves. I also loved that even though the lights are small, and compact, they still do their job! The put out a really great, strong light! Aren't they adorable?! I just love how colorful they are! Uncommon Goods has great, unique gifts that anyone would love! Give someone you love Fun Gifts for Christmas this year :)! 1 of you will receive the same great items I received! 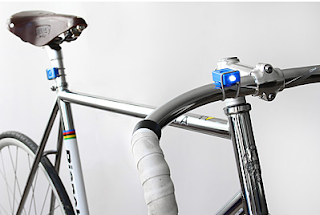 The bike lights, and the bike tire belt! Entering is super easy, with the Rafflecopter form, directly below. If you don't see the form, please try refreshing the page. Disclosure: Review Product was provided to me free of charge. All opinions expressed are my own, and were not influenced in any way. Winner will be drawn via Random.org. Winner will have 48 hours to respond to my email, or a new winner will be chosen. 1 entry per household. 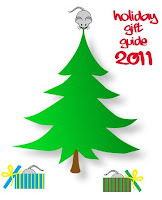 This giveaway will end December 16th, 2011 at 11:459pm. Thanks to Tomoson for partnering me up for this review and giveaway. I like the earth tones sea glass bracelet. They recommend a U-Lock, it is a heavy duty lock that is nearly impossible to break through. It can't guarantee your bike won't be stolen but it will discourage thieves from trying. 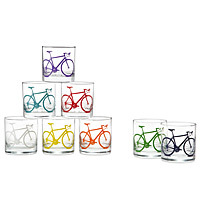 I'd love to have the set of 8 bicycle glasses!